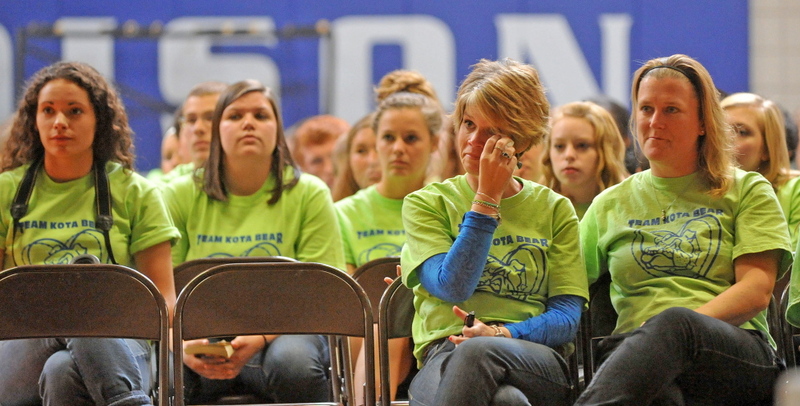 Hundreds of students and community members wore green to support Madison High School student Dykota Cornforth on Friday. 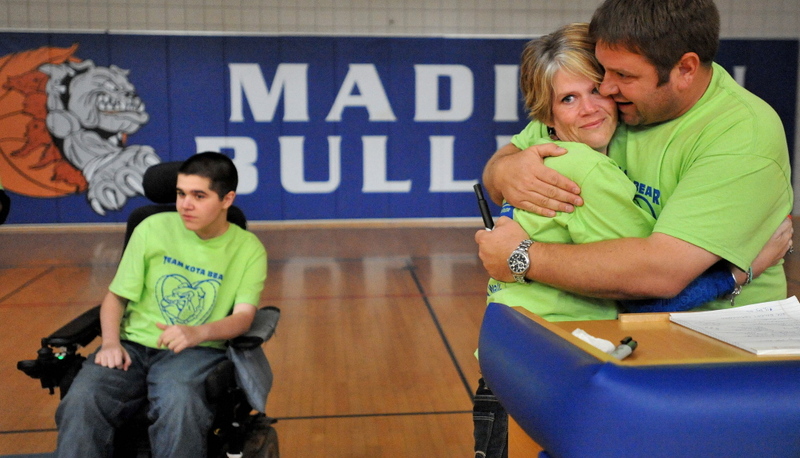 MADISON — When Dykota Cornforth arrived at school Friday morning, he was surprised to see how many of his classmates and peers were wearing matching bright green T-shirts. Green is the official color of muscular dystrophy awareness. Cornforth was diagnosed with the disease with when he was four. He has been forced to use a wheelchair since 2009. Cornforth doesn’t talk much about his illness, but last year after he broke a femur —— low bone density is a side effect of the disease —— and had to miss school, he decided with his family that it might be a good idea to raise awareness. Over the summer Cornforth and his mother, Nycki Bonito, put together a team of people to walk in the Maine Muscle Walk, an annual event hosted by the Muscular Dystrophy Association to raise money for people living with the disease. 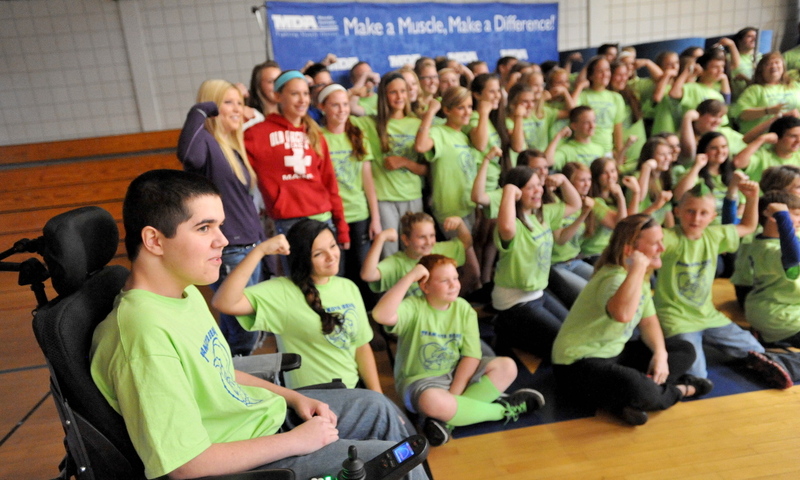 Only 49 young people in Maine have Duchenne muscular dystrophy, the specific type of muscular dystrophy, or muscle disease, that affects Dykota, according to the association. The disease causes muscles to decrease in size and grow weaker over time. Those affected rarely live beyond their 20s. When word of the walk spread to Chris LeBlanc, a friend of the family and the athletic director at Madison Area Memorial High School, where Cornforth is a sophomore, support grew among the school sports teams and the larger community. On Friday, the school presented the Muscular Dystrophy Association of Maine with a check for $15,325 raised by students and the school community. On Saturday, between 50 and 100 members of the school and the larger community will join Cornforth and his family at the walk in Gorham. 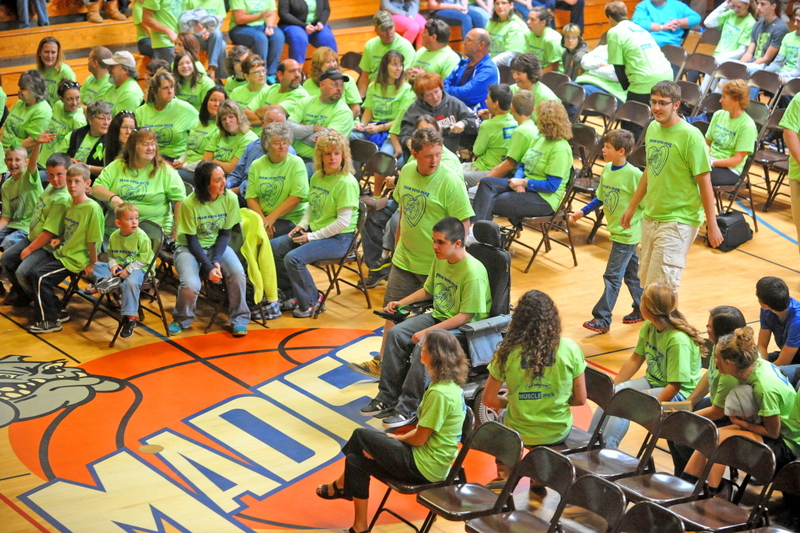 More than 500 bright green shirts were sold to students and members of the community that wore the shirts on Friday, which the town declared Green Day. Green ribbons hung on businesses, telephone poles and outside the school. 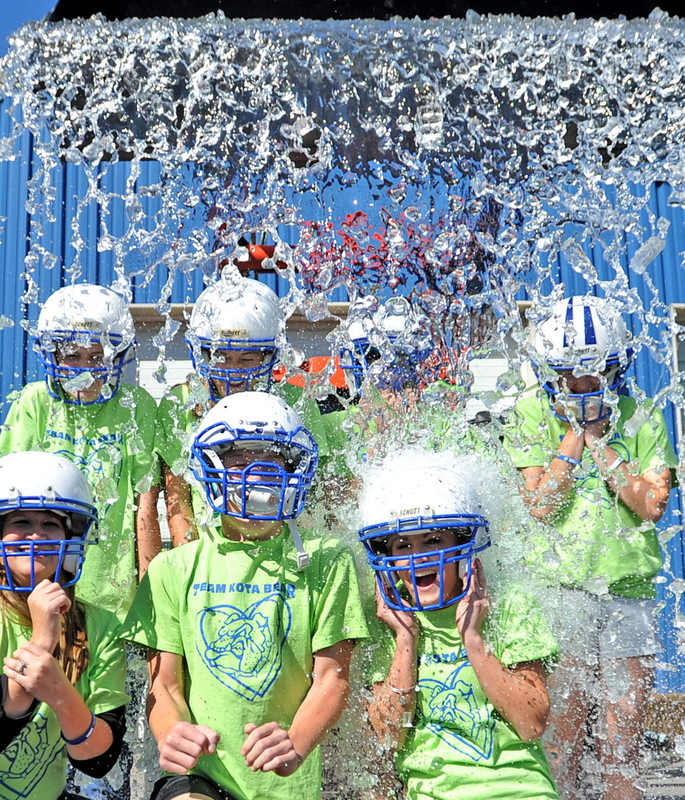 Several students also participated in an ice bucket challenge, a movement that was started to raise awareness for ALS, a degenerative neurological disease, along with Ashley King, the executive director of the Muscular Dystrophy Association of Maine and a 2001 alumna of Madison Area Memorial High School. 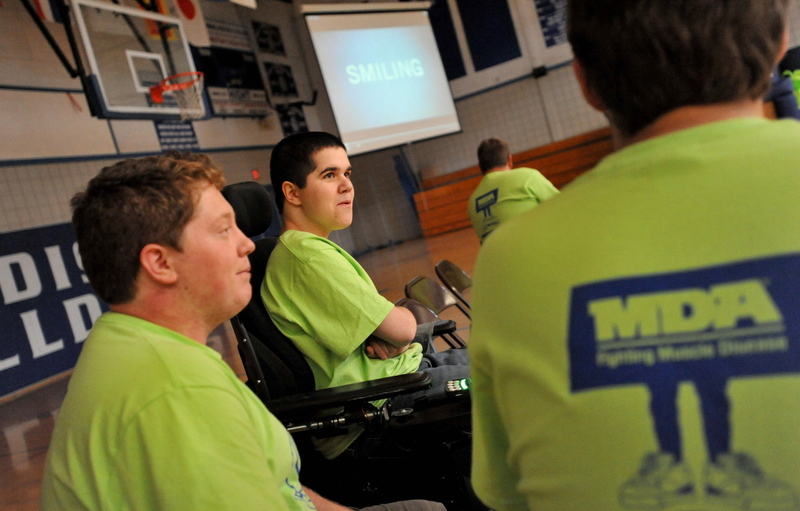 The organization has the goal of spreading the ice bucket challenge to other high schools across Maine to raise awareness for muscular dystrophy, which is in the same family of diseases as ALS, commonly known as Lou Gehrig’s disease. “I was always afraid that my son wouldn’t have those friends that really get you, that are so important when you’re in high school. Now he has two of them,” said Bonito after a school assembly led by Dykota’s friends Mike Spaulding and Jeff Bearor. “I always tried to treat him like a person. I never treated him differently because he’s just Dykota,” said 17-year-old Jeff. His mother, Therese Bearor, was also at the assembly and plans to participate in the walk on Saturday.